Are Service Contracts for Air Conditioning Worth the Money? 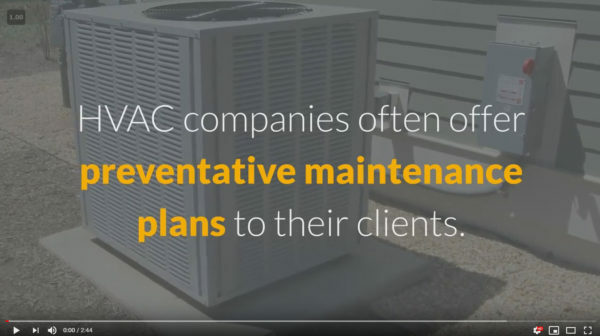 HVAC companies often offer preventative maintenance plans to their clients. Why? Typical A/C maintenance plans cost $200 to $350 per year, with 2 planned check-ups and additional service calls as needed. Good maintenance plans guarantee your A/C system is professionally serviced according to manufacturer’s specifications and it keeps your manufacturer warranty in full force. Not maintaining your A/C system according to manufacturer’s specifications can void your warranty. That’s the first good reason to sign up for a maintenance plan. Second good reason: keeping your A/C operating at optimal capacity. As components wear out, A C systems use more energy to produce the same cooling or heating effect. They become less efficient, and your utility bill increases. The extra cost can easily reach $200 per year! With wear & tear, your A C becomes less able to cool off or heat up your home, and this impacts your quality of life. That’s another very good reason to service your system regularly. A fourth reason to be covered by a maintenance plan is to prevent “cascading failures”. Wear & tear on a single component will force other components to work extra hard. More work = more wear & tear = more failures. This results in unnecessary additional costs. These costs can reach several hundreds of dollars! Under preventative maintenance plans, your HVAC specialist will detect wear and tear BEFORE it becomes catastrophic. This will limit the cost of parts & labor to a minimum, and extend the lifespan of your air conditioning system. A fifth good reason to get protected is the discounts you can get on parts and labor. These discounts alone can cover the cost of maintenance plans. Finally, HVAC companies will often give priority service to clients who select to get protected with a maintenance plan. This is a way to thank you for your loyalty. D&H Air Conditioning has been offering its own maintenance plan for years: “Guardian Planned Maintenance”. Call D&H AC today to inquire about it. D&H Air Conditioning serves Tucson and Southern Arizona for all air conditioning repair services, maintenance and installation services. Subscribe to our YouTube channel to learn more about air conditioning systems and the underbelly of the HVAC industry.